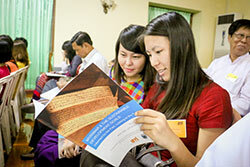 The United Nations Population Fund (UNFPA) urged the Myanmar government to further boost investment in its young people in order not to lose out on a possible “demographic dividend”, at a three day workshop on the sustainable development goals held on 10 July, 2015 at the Yangon University. 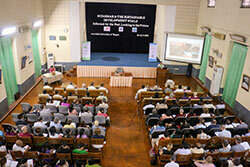 Myanmar’s youth constitute a formidable potential productive asset for driving forward Myanmar’s on-going development. To date young people have been largely absent from participating in political and economic reforms, including the peace process. Janet E. Jackson, UNFPA Representative in Myanmar stressed in her keynote speech the importance of continued investment in young people, citing the latest census results released in May, which showed that almost 51% of Myanmar's overall 51.5 population were below the age of 27. Within this group those aged 5-14 are the largest group and constitutes a "Youth Bulge" that can offer a possible "demographic dividend". "It is unlikely that this opportunity will come sometime again. For Myanmar to reap the benefits in the next 10-15 years, there needs to be targeted investments and work opportunities for young people, when they enter the working age. Myanmar could otherwise lose out in a possible ‘demographic dividend'. UNFPA is therefore urging Myanmar to act quickly and decisively in order for the country to prepare for reaping the demographic dividend. Investing in a highly educated workforce as well as creating equal job opportunities for boys and girls should be at the forefront of the Myanmar on-going social economic transition," said Ms. Jackson. 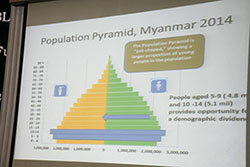 In her presentation Ms. Jackson showed a power point slide of a pot shaped pyramid that indicated Myanmar’s population decline, while it simultaneously is witnessing an opportunity for what is known as a “population bonus”. The “youth bulge” of approximately 10 million, presents a unique opportunity for sustainable economic growth. In order for this population bonus to reach its full potential, policies for young people before they enter the workforce, need to be in place. This will to ensure that they have better access to knowledge and skills through a strengthened education system as well as ensure equal opportunities for boys and girls. The aim of the three day workshop entitled: “Sustainable Development Goals: Informed by the Past, Looking to the Future” was to come up with suggestions and solutions for how to strengthening Myanmar’s ongoing reform, pressing forward in its aspiration to graduate to middle income country within its next stage of development. A range of related topics were tackled over the three days, including local governance, transparency, armed conflict and peace, economic growth such as urban and community development. Also on the agenda was improving access to health care and service delivery, education sector, employment opportunities, gender equality, alleviating poverty and using best practices for preserving Myanmar’s cultural heritage. The demographic dividend concept was coined in 1994 at the International Conference on Population and Development (ICPD) held in Cairo, Egypt. The term refers to a period of 20-30 years within a country when fertility rates fall due to significant reductions in child and infant mortality rates. As families become smaller this cuts spending on non-productive dependents and boosts economic growth. The decline in family sizes are often followed by an increase in the average life expectancy that increases the portion of the population that is in the working age-group (15-64). The 2014 census data showed that the labour force among the population age between 15-64 years is 67%. Males constitute a significantly higher proportion of the work force with 85.5% compared to that of females 50.5%. Unemployment is 4% and nearly twice as high for those aged 15-29. 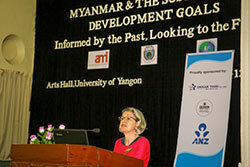 The three day workshop was organised in cooperation Australia Myanmar Institute (AMI), the University of Yangon, and Myanmar Institute of Strategic and International Studies (MISIS). According to the Ministry of Planning’s keynote speech at the conference, Myanmar is in the process of developing a 2016-2030 long-term plan and its framework for its next five-year plan is expected to be ready for wider consultation in September/October 2015. With only a few months until the United Nations’ eight Millennium Development Goals (MDGs) expires and are officially transferred into 17 Sustainable Development Goals (SDGs) the global countdown has begun. Representatives from the international and Myanmar academic community, United Nations Population Fund (UNFPA) representatives and other UN bodies, international and non-government organizations, including the media attended the three day workshop to discuss how to adapt and implement the new post-2015 United Nations sustainable development goals into the on-going Myanmar reform process.